Change the Washington Redskins Name. I was asked by a friend about the Washington Redskins name issue, which was so eloquently written about in the New York Times Opinion Pages on June 24 by Michael Lewis and Manish Tripath. Here is essentially what I wrote as a reply…. This is an interesting branding question on many levels. I am in complete agreement with the Michael Lewis and Manish Tripath conclusion. 1. Money aside, (changing the name) is the right thing to do. 2. The “model” they used (have not seen it) indicates no significant loss in revenue. My experience with name changes would bear this out. In fact, the opposite is often the case. I understand the argument about existing brand equity, but there are other important factors. 3. We would advise that the team owners look at a new name as an opportunity to re-energize the fan base. What if it attracted more fans and advertisers? Looking at the upside might help all involved think about a different and better brand and future for the franchise. 4. Lewis’s idea of involving the Native American community leaders is a brilliant way to move forward in a positive manner. It could result in an even larger upside, albeit the process might be complex so as not to disenfranchise anyone. Change is scary for many, but, in this case, necessary. Not only has the U.S. Patent & Trademark Office voted to strip the team of trademark protections, but changing the name is the right thing to do. 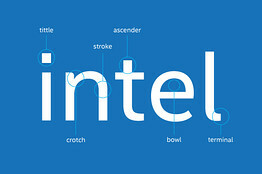 Intel just created its own proprietary corporate font to be easier to read in the global digital world. They call it “Intel Clear”. A smart move in a number of ways. First, it gave them the opportunity to assess the equity in their existing font and think through whether and how much to change. Second, It caused them to think about how their critical audiences, internal and external, national and international, should perceive Intel as the communications media evolve so dramatically and rapidly.